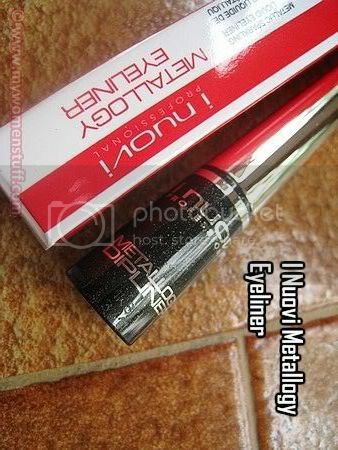 When I received the new I Nuovi Metallogy Metallic Liquid Liner, I was quite hesitant to try it. I’ve NEVER had a good experience with liquid liner which explains why you never read about it here. I just have no idea how on earth to use it! The I Nuovi metallic liquid liner comes in a little tube with a long pointed handle. I used to wonder why liquid liners came with such long covers – now I know. Its so you have a better grip while lining your eyes. I’d prop my hand on my cheek and angle the brush on its side to draw a quick line and it worked for me. The applicator is a thin firm pointed brush and when you pull it out of the tube, it tends to “stick” a little, rather like mascara does. So if you aren’t careful, you can spatter some liquid on your hand but its not all that drastic as I make it out to be. The I Nuovi metallic eye liner applies a dark black with silver sparkles (my colour is Black Magic). Its a nice black unlike then thin dark greys you sometimes get in a liner that try to pass for black. It was not as hard as I thought to make a thin line but I would get frustrated because I’d blink before it dried and then the line would transfer to my lid. I had less problems with my left eye. Strange. Here’s how I ended up doing my eyes to prevent the liner transferring to my eyelid. Tilt your head up so you are looking at a downwards angle at the mirror. Rest the side of your hand against your cheek for stability and in a quick motion, draw a line close to your eyelashes from the inside to the outside. Wait a while for the liner to dry before dropping your head back down or blinking. I found that when I kept my head up, the liner did not transfer even when I blinked gently. However don’t try opening your eyes too wide – it can still transfer. The ink takes a while to dry which can be a hassle if you are short of time. The water based liner did not fade although I was out in the hot sun taking photos of a pink dragon dance 🙂 and neither did it run. The sparkles aren’t all that obvious on your eyes are they are on the back of the hand. So it depends on what you like – for me it suited me just fine because its not so glittery to distract and I can wear this to work (yes I have a very relaxed dress code 🙂 ) I had no problems removing it with my regular eye makeup remover. There are 4 colours available – Black Diamond, Midnight Rust, Liquid Crystal and Gold Shimmer. I’m not sure why the names on the website don’t correspond to the name of the product I have. 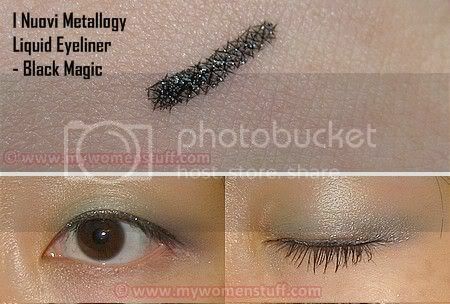 Also, the box says Metallogy EyeLiner while the tube itself says Metallogy Dipliner. Names aside, I think it a pretty decent product if it could just dry a tad faster. A 2.5ml tube retails for RM65 (S$35/ US$28.50). I Nuovi is available worldwide and you can find your nearest store here. In Malaysia, you can find I Nuovi at Sunway Pyramid, selected Parkson and Metrojaya stores and in Sasa stores throughout the country (I failed to find it in Sasa MidValley Megamall though). NEXT POST: Exclusive: Smashbox Cosmetics coming soon to Malaysia! that’s a nice neat line! i can never try a line properly 🙁 will check this out at their counter, however, rm68 is quite an ouch! I like liquid eyeliner. I started with Estee Lauder liquid liner, yes, without going through the pencil phase. And till today, I don’t know how to use a pencil liner. Actually, I really really want to learn how to use a pencil liner because I have so many of them from gift sets and liquid liner are pretty expensive. Thanks for sharing. I actually find it easier to use pencils and I respect anyone who can use liquid liner! That said, I’ve been practicing and its been getting easier so yay! I prefer liquid eye liner too! This is not because I don’t know how to use a pencil liner, it’s just that pencil liner is invisible when I’m trying to apply it. It’s because I have dark eye ring so by using the pencil liner will not be obvious. My mum had given me a tip by using lotion to wet the pencil liner with it, but still I failed miserably. So I’ll stick with my liquid liner. Elianto Liquid Liner is a good buy for those who are on budget as I used it before I upgraded to Kanebo Liquid Liner. So far so good no complaint. Except sometimes, I forgotten and I blink… hahaha same issue. Yeah!?! Yet another one I must respect! The benefit of pencil liner is the ability to smudge it for smokey eyes. Liquid liner gives a more defined look. Much depends on what kind of look you are looking for. If liquid works for you, stick with it! i love the performance of liquid liner and it never smudge (except if i cry or sweat a lot) even though it’s non waterproof. Pencil liners are nice for softer looks I find. My fave is still the Guerlain Kohl – pricey but oh so worth it! Just want to know whether liquid eyeliner is suitable to be used on the lower lashes. Thanks. Yes it can be used on the lower lashes. It can look harsh though which is why many people don’t.